By the time you finish reading this post another 18 motorcycles will have been stolen. In the U.S. there are more than 8 motorcycles stolen every minute of every day through-out the year! Back in 2004 I remember spending several hours with the Laughlin, NV Police getting questioned and filling out paperwork after a FatBoy was “removed” from the security monitored Flamingo (now Aquarius) Parking garage without our buddies permission! 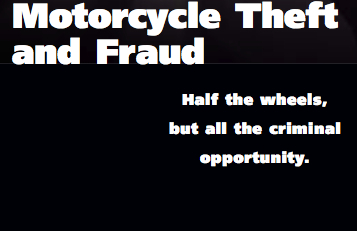 The National Insurance Crime Bureau (NICB) states that 60,763 motorcycles were reported stolen in the U.S. during 2008. That number is down 2.3% from 2007 when 62,206 were stolen and down 4.8% from 2006 when 63,828 disappeared. There are 684 different makes of motorcycles identified in the report. Motorcycle theft is seasonal compared to other vehicles with July-August accounting for the highest thefts. KTM, Baja and Vespa were the only motorcycle brands which experienced increases in thefts during this period. The industry has a 30.3% recovery rate (18,422 recovered of 60,763 thefts) which is down from previous years. I’m always amazed when I ride by a house that has a motorcycle parked outside and more often than not lacking any theft protection. Sure they could have an immobilizer which isn’t visible, but locks/chains do provide visible discouragement to would-be thieves. Most often the suggestion is to secure a motorcycle to some type of permanent structure or in-ground anchor with a high-quality chain, cable or other device to help prevent theft. Personally I use a combination of disc and armored cable locks along with the provided motorcycle fork lock. I don’t have storage capacity to carry a high security 6-sided boron manganese steel chain type device nor do I want the extra riding weight. I do want to provide enough of a visible deterrent so thieves will go for an easier target once I arrive at my destination.